In the example below, there are four pupils listed under the heading “Result for ‘Reading’: P8.0”. 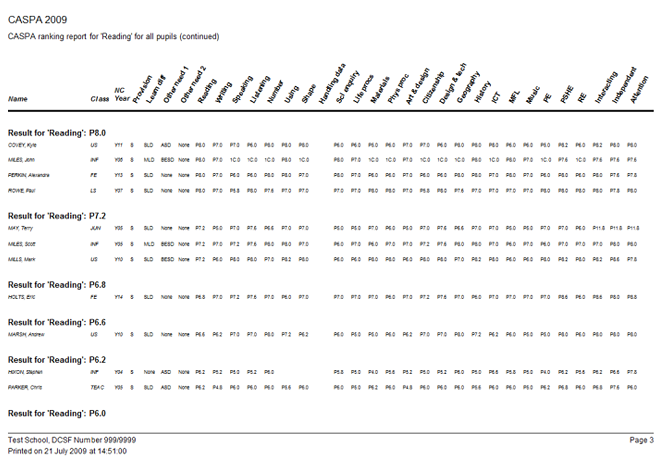 All four are in different year groups and classes and have a range of different categories of need – the one factor they all have in common is that they have been assessed at a Level P8 for Reading, which would imply all four share the same ability in Reading. A quick review of the report allows teachers to ask whether, from what they know about these pupils, they would expect them all to have been assessed at a Level P8, and whether they would expect each of these pupils to have been assessed at a higher level than each of the pupils assessed at a Level P7.2, and lower than each of the group of pupils assessed at a Level 1C.0; if any individual pupil’s assessment appears inconsistent with their peers, this may point to the need for additional moderation of their assessment. Click here or on the image below to open the whole report as a pdf document to view and print.